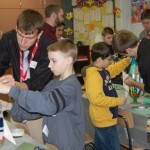 For over 30 years, the Technology Education Department at Millersville University has been partnering with the 5th grade classes at Conestoga Elementary. 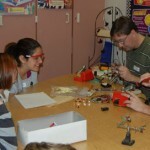 The college students develop a lesson plan based on the elementary curriculum, bring all the necessary equipment and supplies, and instruct the classes. This year, Mrs. Usciak’s class made Jamestown Houses to compliment their social studies unit on the 13 colonies. 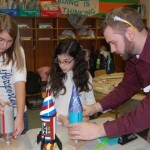 Mrs. Falk’s class made bottle rockets utilizing elements of both the math and science curriculum.